When Valkor said, “We have a new item from ADATA” I was expecting a power bank or a new USB device. 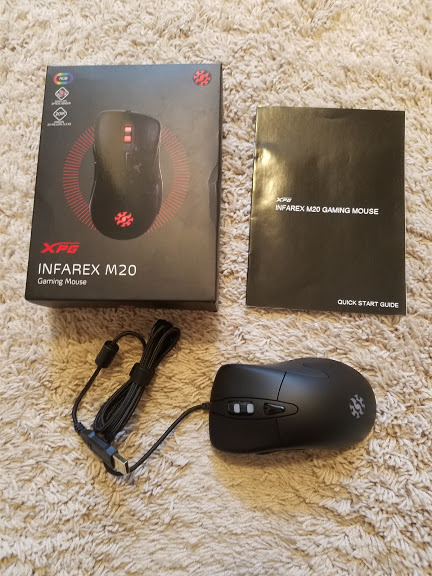 However, it was a nice surprise to see that it was the XPG Infarex M20 Gaming Mouse sitting on my desk, waiting to be opened. I remember ADATA announcing back in November 2018, they were releasing the Infarex M20 alongside the K10 Keyboard. So let’s see what their latest gaming mouse brings to the table. 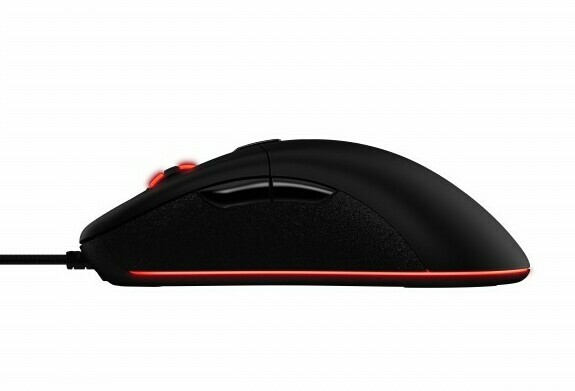 The M20 is a standard right-handed gaming mouse with a solid black exterior attached to a braided USB cable. 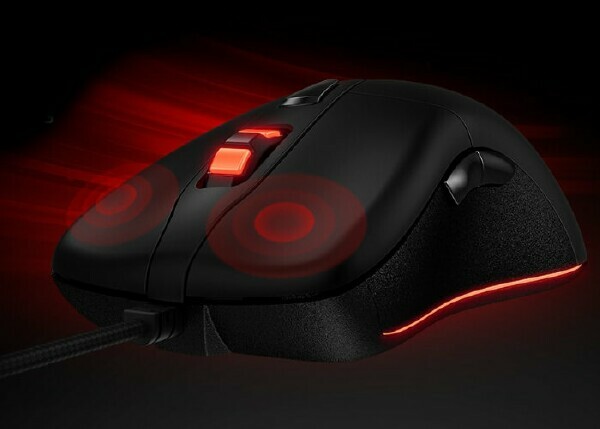 It’s a six-button design, which seems like the standard for gaming mice: Left/right, mouse wheel, DPI and the forward/backward above the thumb rest. 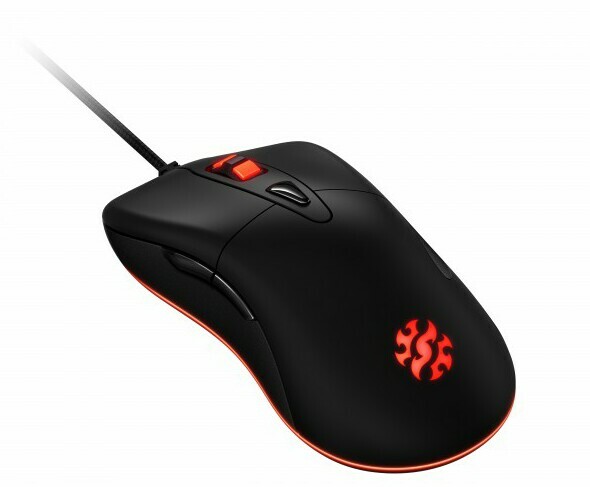 If you’re not familiar with a DPI button it normally sits on top of the mouse and controls the "dot per inch" that can give you a short or long range of motion across the screen. On the M20 you have a choice of 400/800/1600/3200/5000 but, I'll cover more on this below. On the bottom, there are two additional switches, one to turn on/off the Led and the other to adjust the report rate from 250/500/1000 Hz. 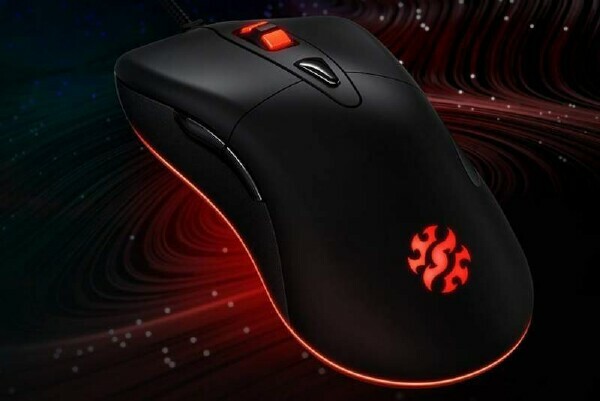 Report rate or polling rate is how often the mouse tells the PC its position in milliseconds, to give you a general idea 250 = 4ms, 500 = 2ms, and 1000 = 1ms. 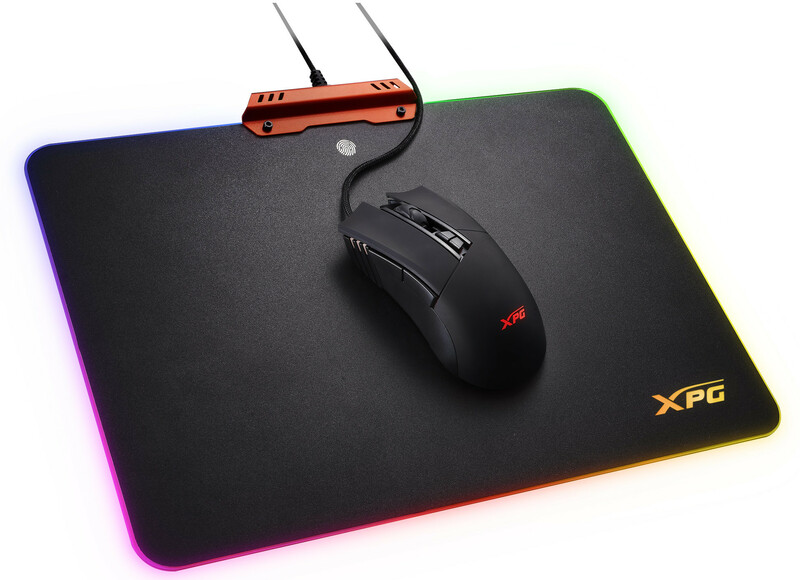 As far as the aesthetics of the M20 goes there are three accent LEDs: the first is at the palm rest, the second is on the mouse wheel and the third lines the base, giving you a really interesting separation from the mousepad. The LEDs have only one pattern that I know of - a breathing solid color in a rotation. As far as I can tell, there is no way to make adjustments. The only other option is to turn off the LEDs as mentioned above. When it comes to my day to day use with the M20 writing, editing and trolling Reddit, the mouse works very well, especially when it's set to 250Hz and 1600 DPI and single monitor use. 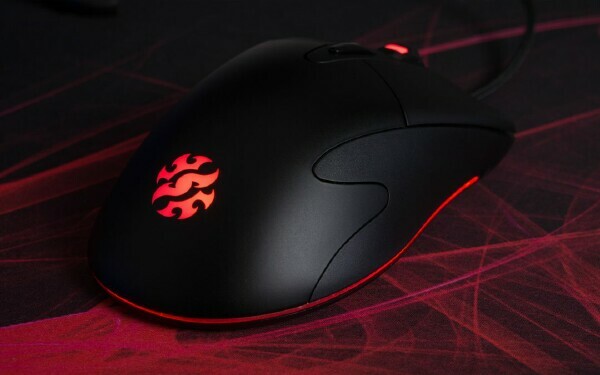 I find that for daily use the poll rate doesn’t really matter as the average mouse these days works around 125/250 so at minimal settings, the pointer movement was as expected. If you have a triple monitor set-up, I do recommend a minimum of 500Hz and 3200 DPI, as it fits perfectly going from corner to corner. Also the higher in DPI the higher the Report rate should go, if you don’t raise the Report rate it will start getting jumpy. The other DPI 400/800 would come in handy for precision but too sluggish for average work. And 5000 DPI, I lost track of the pointer every other second, though it would come in handy with a Large 4k monitors. For now, for me, it's not practical. But this is a gaming mouse and day to day use doesn’t really count that much. For gaming, I did bump up the report rate to 1000 Hz and kept the DPI at 3200. 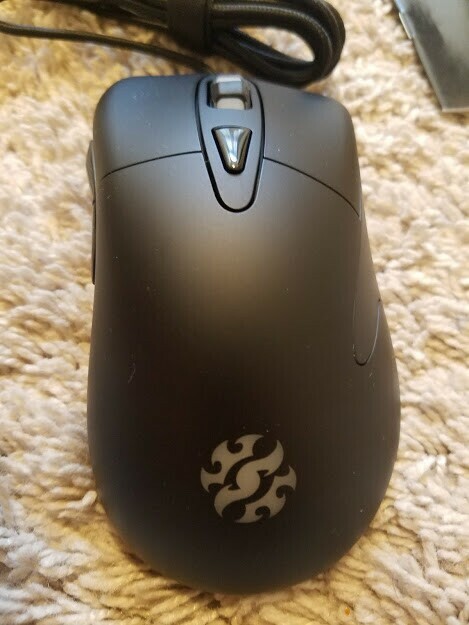 I gave the mouse a solid two weeks of use before I finished this review; one of the first things I did notice was that my ring finger lies entirely on the mouse pad wherein with other gaming mice there is a deeper indent for your ring finger to semi-rest on. It does change how I grip the mouse as I notice I will palm slap the mouse instead of the usual claw. I have long formed habits when it comes to my typical game list; Diablo 3 is my usual point of reference for button performance as it’s a very click happy game. StarCraft 2 is for a mix of mouse movement and button. And then I'll finish with Black Ops 4 as my son has been playing since November and I can’t seem to get ahead of him. The sleds over long term worked very well and the grip made little difference even after hours of play. I will say, specifically for FPS, I did have to change my style of play as I’m used to switching the DPI frequently. The DPI button was easily accessible when I needed to make changes. And I found that as I changed the DPI it had different colors assigned. However, I kept forgetting which setting I was at, so that might just be a "me" issue. I will say that for me with the 500Hz and 1000Hz I didn’t notice a big difference while gaming. Granted, I'm probably not the fastest player out there but even going back and forth between 3 screens seems to show a minimal difference. I was very happy with the performance of the mouse and didn’t notice any failures or misses. On the negative side, just from a purchaser standpoint, I did find the website and the included spec sheet a little lacking of information on the internals of the M20; I know what OMRON switches are but couldn’t find much more than that. At least a model number or series would help. I would also like to add that I hadn't noticed the plastic shield on the bottom sleds and it took me a few days to figure out why it was so sluggish. But in my defense, they were on there perfectly and with no removal tabs. 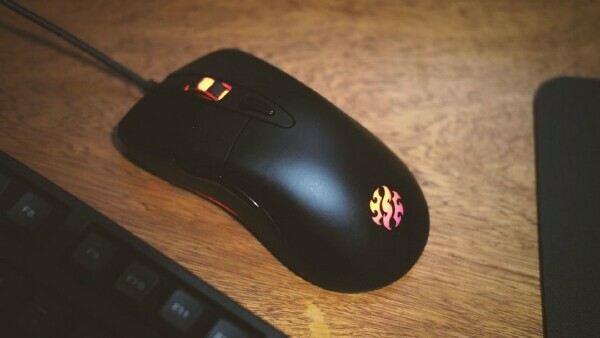 I will say this for ADATA's XPG Infarex M20 gaming mouse, it performs so damn well and it's definitely cool to look at, with a sweet price that I currently found at the time of this review under 25 bucks! Overall, I was pretty impressed with ADATA XPG Infarex M20, which I'm giving a perfect 5 out of TOV 5 stars!